Los Baños, Philippines - The International Rice Research Institute (IRRI) has appointed Jacqueline d’Arros Hughes as its eighth deputy director general for research. She will assume her duties on 30 March 2016. Jackie brings to IRRI a combination of agricultural research leadership and management expertise, with a career spanning more than three decades in Asia, Africa, and Europe. At IRRI, she will oversee the institute’s global research agenda in plant breeding, genetics, crop and environmental sciences, and the social sciences. Jackie comes to IRRI from AVRDC - The World Vegetable Center in Taiwan, where she served for a decade as deputy director general for research. Before that, she spent more than 10 years at the International Institute of Tropical Agriculture IITA) in Nigeria, taking on positions of progressive responsibility throughout her tenure. Jackie was also technical cooperation officer in virology at the Cocoa Research Institute in Ghana and higher scientific officer at the United Kingdom’s Institute of Horticultural Research. Her early career started with work as tropical root and tuber virologist at the Glasshouse Crops Research Institute and research fellow in molecular virology at the University of Birmingham, both in the United Kingdom (UK). IRRI’s new deputy director general has an extensive publication record in such areas as agricultural science, global nutrition, and climate change. She has held many prestigious board memberships and has been elected to various fellowships, including the Royal Society of Biology. Jackie received her Ph.D. in microbiology/virology and bachelor of science in agricultural botany from the University of Reading, UK. She succeeds Matthew Morell as IRRI’s research chief, who became IRRI's new director general on 19 December 2015. Tarlac, Philippines – For two years, the Department of Agriculture (DA) and the International Rice Research Institute (IRRI) have been collaborating on a decision tool that uses mobile devices and computers in providing recommendations to rice farmers to help them increase their yield. Funded by the DA through the Food Staples Sufficiency Program (FSSP), this decision tool called Rice Crop Manager (RCM), has posted positive results of increasing the yield and net income of farmers. Initial research shows that rice farmers in Isabela, Nueva Ecija, Oriental Mindoro, and Agusan del Norte increased their average yield by 300 kilograms and average net income by about PHP 4,000 per crop per hectare. Quezon City, Philippines – The National Food Authority (NFA) will soon grant a single certification, instead of multiple transport permits, for all rice varieties that will be brought into the country by the International Rice Research Institute (IRRI) for purposes of experimentation and research. 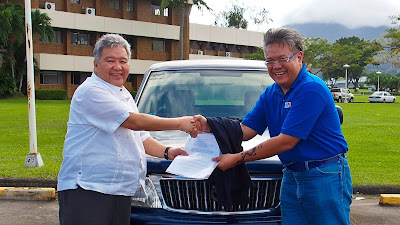 The two agencies signed the Memorandum of Agreement (MOA) on 14 December 2015 at the NFA Central Office in Quezon City. Participants from IRRI and BRRI working on the Rice Doctor for Bangladesh. Los Baños, Laguna – The International Rice Research Institute (IRRI), in partnership with the Bangladesh Rice Research Institute (BRRI), has started developing the Rice Doctor for Bangladesh in a workshop held on 16-18 December 2015 at the IRRI Training Center. The main goal of the workshop was to prepare the initial structure and plans for a version of the Rice Doctor that would specifically cater to crop problems experienced in Bangladesh. Later on, the product would be translated to the local language, Bengali. LOS BAÑOS, Laguna – The Asian Development Bank (ADB) and the International Rice Research Institute (IRRI) are set on bringing their 40-year partnership to a new level. “It is a good idea to formalize our partnership,” said ADB President Takehiko Nakao, who was at IRRI yesterday (17 December 2015) with members of the bank’s leadership to visit experimental sites and discuss with IRRI management and scientists collaboration on agricultural development and food security across Asia. ADB and IRRI have worked together since 1975, with ADB financing 33 projects involving USD 26 million in grants for research, capacity building, and infrastructure development. Hyderabad, India - The Green Super Rice (GSR) project will be completing its second phase on 31 December 2015. The completion workshop for project partners in Asia was held on 21-23 November at the Indian Institute of Rice Research (IIRR) in Hyderabad, India. Uttar Pradesh, India – A review of stress-tolerant rice varieties (STRVs) was held in Lucknow in early November, with promising results. Drought-tolerant variety Sahbhagi dhan received good reviews from farmers as well as from NGOs. Director General Robert Zeigler and IRRI Board Chair Emerlinda Roman. In stirring rites held early Friday afternoon at the headquarters of the International Rice Research Institute (IRRI), Matthew Morell took over the reins as the institute’s ninth director general (DG). Outgoing DG Robert Zeigler presented Morell with the IRRI charter and flag during the turnover ceremony. Zeigler, an internationally respected plant pathologist with more than 30 years of experience in agricultural research in the developing world, was IRRI’s DG for a little more than 10 years—the second longest tenure after the institute’s founding DG, Chandler. As DG, Zeigler set the institute’s strategic direction and was a passionate spokesperson on a wide range of issues that affect rice growers and consumers worldwide. Morell, who has been IRRI’s deputy director general for research since February 2014, has shown effective strategic leadership of the institute. He brings to IRRI decades of experience, driven by great enthusiasm for scientific excellence and a sound capacity for stakeholder engagement. 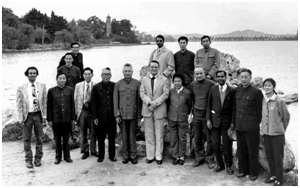 Prior to his arrival at IRRI, Morell worked for 16 years at Australia’s Commonwealth Scientific and Industrial Research Organisation (CSIRO). Also sharing their thoughts and hopes during the turnover were Emerlinda Roman, chair of the IRRI Board of Trustees; J.K. Ladha, representing IRRI’s senior scientists; Amelia Henry, representing IRRI’s young scientists; Joseph Sandro, representing the IRRI Filipino Scientists Association; Casiano Estrella, Jr., representing rice farmers around the world; Councilor Jaime Jimenez, representing the local government of Bay; and Serlie Jamias, vice chancellor for community affairs of the University of the Philippines Los Baños. Following the ceremony at the Havener Auditorium in IRRI, the audience of visiting dignitaries and IRRI staff moved across the street to a newly constructed observation deck overlooking the institute’s 209-hectare experiment station. In a brief dedication ceremony (video above), the expanse was dedicated as the Zeigler Experiment Station. A plaque stating such was unveiled in front of a surprised and visibly touched Zeigler by his wife Crissan, and BOT Chair Roman. Access 17-video playlist of the day's speakers and events on YouTube. the plaque designating the IRRI research farm as the Zeigler Experiment Station. Makati City, Philippines - By 2017, the domestic rice market could be flooded with imports from other ASEAN countries. Under the ASEAN Integration 2015, the region will be transformed into a single market. There will be free movement of goods, services, investment, skilled labor, and capital among ASEAN nations to help the region compete in the global market. Under the agreement, many industries, including agriculture “shall be open and national treatment granted to investors” both at the pre- and post-establishment stages. Restrictions on imported rice will be gradually lifted over a 5-year term. This could hurt local rice industries and farmers if measures are not taken to help them become more competitive. In the Philippines, Nueva Ecija is the gold standard when it comes to the country’s rice production. However, compared to similarly intensively cultivated sites such as Can Tho in Vietnam, Suphan Buri in Thailand, Tamil Nadu in India, Zhe Jiang in China, and West Java in Indonesia, Nueva Ecija still has much room for improvement. "Aside from being in the list of top ten rice-producing countries in the world, the selected sites have more or less similar climatic conditions,” explained Piedad Moya, co-project leader of a study on Philippine rice economy relative to its neighboring countries. “All of them are irrigated, and can plant at least two rice crops a year." The study, Benchmarking Philippine rice economy relative to major rice-producing countries in Asia, is funded by the Department of Agriculture (DA), and undertaken in close collaboration with the Philippine Rice Research Institute (PhilRice), and the International Rice Research Institute (IRRI). Although production costs in Nueva Ecija may be lower (Php12.41) than other rice importers, such as China (Php14.07) and Indonesia (Php15.77), it is still significantly higher compared with exporters such as India (Php8.87), Thailand (Php9.46), or Vietnam (Php6.53) per kilogram of dry paddy. The high cost of producing a kilogram of paddy in Nueva Ecija is due to the huge labor requirement during manual transplanting (25 man-days) and harvesting or threshing (21 man-days). Vietnam, on the other hand, which has the lowest production cost, uses direct seeding (2 man-days) and combine harvesters (2 man-days) resulting in increased productivity and higher efficiency. The study also noted higher milling efficiency in almost all rice-exporting countries that leads to fewer broken grains and higher milling recovery. This is attributed to rice varieties that have similar grain shape and length. Moreover, farmers in rice-exporting countries have better bargaining power. However, experts from PhilRice and IRRI believe that Filipino rice farmers can be more competitive by following suit. "In the context of the ASEAN economic community, and in anticipation of the free flow of goods among member countries, enhancing competitiveness cannot be just a soundbite,” DA Secretary Proceso Alcala remarked. “We must translate competitiveness into practical interventions that lead to the capacity of farmers to compete and expand their engagement in agribusiness opportunities." Madonna Casimero, senior scientist and IRRI’s Philippine research and development coordinator, agrees. "As the Honorable Secretary stated, the Filipino farmer is at the center of the Food Staples Sufficiency Program (FSSP),” she said. "Hence, IRRI and the DA are implementing seven flagship FSSP initiatives, including the benchmarking study, aimed at helping our Filipino farmers." The 3rd research seminar of the Benchmarking Philippine rice economy relative to major rice-producing countries in Asia was held in Makati City on 03 December. Los Baños, Philippines - The Young Researchers' Lunch for December hosted Marco Wopereis. Wopereis is currently Deputy Director General and Director of Research for Development of the Africa Rice Center (AfricaRice), positions he has held since November 2007. He is succeeding J.D.H Keatinge as Director General of AVRDC-The World Vegetable Center in Taiwan. Wopereis has extensive experience in research for development related to integrated natural resources management, and rice in particular. He served as AfricaRice’s irrigated rice agronomist in Senegal from 1994-2000. He also worked for IRRI (1989-1994) and the International Centre for Soil Fertility and Agricultural Development (2002-2005) in Togo. In describing his career path, Wopereis emphasized the importance of having a supportive partner and making family decisions when changing posts. He encouraged young researchers to work in Africa, which described as “an exciting challenge” and “something different” from working at IRRI in the Philippines. Participants were Maria Dwiyanti, Sung Ryul Kim, Rebecca Laza, Crisanta Bueno, Manuel Marcaida, and Majid Mortazavi. Los Baños, Philippines -The objective of continuous improvement in farm operations of the Experiment Station is top priority for James Quilty, head of the Experiment Station (ES). In collaboration with the IRRI Training Center and the Postharvest Unit, nine staff members of the IRRI Experiment Station consisting of mechanics, operators, and field supervisors, attended the second batch of a three-day training course on Farm Machinery Safety and Operation on 1-3 December 2015 at the IRRI Training Center. The training activity was designed to hone the skills and knowledge of ES staff in the safe operation and maintenance of machines used in IRRI’s experimental fields and facilities. The training was facilitated by Joseph Rickman, Martin Gummert, Nguyen Van Hung, and Carlito Balingbing from the Postharvest Unit. Safety was highlighted, as well as the important role of communication between the operators, the mechanics, and the warehouse staff in keeping the tractor fleet and equipment functioning efficiently and safely on the farm. “Everybody’s got to work together. It’s not just the operators’ job. The operator should remind the mechanic what’s not working and the warehouse must provide the needed parts,” Rickman said. During the three-day course, participants updated their theoretical knowledge via classroom discussion and their practical skills in appropriate maintenance and operation of farm equipment, which includes tractors with implements (i.e., rotovator, mower, and baler) and combine harvesters. Roger Elbo, a senior Trained Crop and Pesticide Application (TCPA) technician, appreciated the training because, on top of learning how to drive and park machines correctly, which he learned from fellow technicians, his basic skills in preparing equipment through proper hitching (and unhitching) and maintenance checks through WOGAM (water, oil, gas, air, and miscellaneous) were also reinforced. At the end of the training course, participants were given an exam (both theoretical and practical) to assess what they had learned. The results will be the basis for issuing certificates and accreditation to operators of farm machinery at ES. James Quilty is keen on instituting the certification of all equipment operators and mechanics at ES to ensure safety and that farm machinery are taken care of and properly maintained. The agricultural engineers of the Postharvest Unit will be the ones giving accreditation exams to farm equipment operators based on the needs of ES. Martin Gummert, head of the Postharvest Unit, expressed his support for the collaboration, which is a step forward in IRRI’s R&D mechanization strategy. Los Baños, Philippines - The International Rice Research Institute (IRRI) is pleased to announce the appointment of Michele Weldon as head of partnerships and development. In this role, Weldon will work with the Partnerships Office and relevant IRRI staff in strengthening the institute’s relations with the national agricultural research and extension systems (NARES) of partner countries. Together with the Donor Relations and Project Coordination (DRPC) Unit, Weldon will also help bolster IRRI’s capacity to identify and develop funding partnerships with key philanthropic institutions. 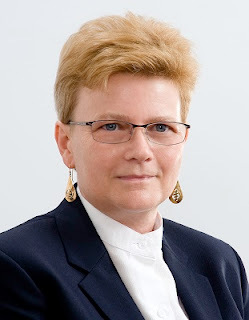 Weldon brings more than twenty years of experience in managing development and environmental programs with think tanks, the private sector, nongovernment organizations, and the United Nations (UN). She has a wide range of experience across many countries, including Spain, Hong Kong, Cambodia, Thailand, and India. Prior to joining IRRI, Weldon has worked for the World Health Organization and UN Women. Weldon assumed her role on 23 November 2015. She will be working at the IRRI India office in New Delhi until July 2016 to initially focus on South Asia. In the meantime, she will be traveling to and from the Philippines before she settles in Los Baños from then onward. Los Baños, Laguna – An external review of CORIGAP—a project working on closing rice yield gaps through environmentally sustainable means—evaluated the key outcomes and the quality, relevance, and effectiveness of its research and collaboration in six Southeast Asian countries during the first 3 years of implementation. The first phase assessment of CORIGAP (Closing rice yield gaps in Asia with reduced environmental footprint) was commissioned by IRRI’s office of the Deputy Director General for Research. Specifically, the review focused on progress made in developing best management practices that increase yield and productivity using less input, while reducing the environmental footprint of rice production. The project is implemented in six major rice-growing countries—China, Indonesia, Myanmar, Thailand, Vietnam, and Sri Lanka, and is aimed at ensuring food security and gender equity, and alleviating poverty through optimized productivity and environmental sustainability of irrigated rice production systems. The external reviewers, composed of Willet, and Karen Barroga, a development communication expert, met with key CORIGAP researchers and scientists to (1) assess the key outputs and future direction of the CORIGAP project; (2) identify areas to strengthen, modify, and refocus activities and outputs; (3) assess relevance and quality of research and extension approaches of the project; and, (4) review the effectiveness of collaboration for sustaining research and extension partnerships in the countries. Grant Singleton, CORIGAP coordinator, provided an overview of the multi-disciplinary project that focuses on sustainable intensification of rice production in major rice bowls in the six Asian countries. He highlighted effective partnerships with national agencies and an active advisory committee, which ensures that the CORIGAP research is well aligned with national rice program initiatives. He also reported on strong progress in building the capacity of the next generation of rice scientists. “I am delighted to see the progress of how CORIGAP took off from the initiatives of the Irrigated Rice Research Consortium,” Barroga said. “The new research fields made the work more interesting and integrative. The challenge is to communicate the research outcomes well, considering the complexity of the project,” she added. Aside from providing country progress reports, CORIGAP scientists discussed progress of research on ecological indicators (Sarah Beebout), field calculators (Ando Radanielson), biodiversity (Buyung Hadi), postharvest (Martin Gummert), women in rice farming (Pieter Rutsaert), yield gaps (Alex Stuart), entry points for sustainability and value chains (Matty Demont), and learning alliances and communication (Reianne Quilloy). After the progress reports and field visits, reviewers will assess the current setup of CORIGAP and, if a second phase is warranted, will give recommendations on the direction of the next phase. The project’s second phase is expected to commence in 2017 and run for 4 years. CORIGAP began in January 2013 and the first phase of this USD5.2 million-project funded by the Swiss Agency for Development and Cooperation concludes in December 2016. Makati City, Philippines - Rice farmers, particularly smallholder farmers, are vulnerable to the risks of drought, flooding, and pest outbreaks. Generating rice production forecasts, assessing the impact of disasters on the rice crop, and revealing the incidence of pests and disease are immensely valuable in planning mitigation and intervention strategies for supporting food security in the face of increasingly unpredictable weather patterns due to climate change. These are the key points made by Dr. Alice Laborte, IRRI geographical information system specialist, at the forum on forecast-based emergency preparedness for climate risks. The forum is the first conference of the FoRECAST (Food Resilency in Emergencies and Climate Change Adaptation Systems Tracking) project of the World Food Programme (WFP)-Philippines. “Accurate, timely, and detailed information enables policymakers, disaster response teams, crop insurance providers, researchers, and other stakeholders to assess the current and forthcoming status of the rice crop,” explained Laborte, who also leads the Philippine Rice Information System (PRISM) project at IRRI. PRISM is a joint project of the Philippine Department of Agriculture, Philippine Rice Research Institute, sarmap, and IRRI. “They need this information to act and adjust accordingly,” Laborte said. In fact, Philippine Agriculture Secretary Proceso Alcala recently sought the assistance of PRISM in assessing rice fields affected by Typhoon Lando (international name: Koppu) using satellite images over Central Luzon. Remote sensing-based Information and Insurance for Crops in Emerging economies (RIICE), another project at IRRI, also uses radar-based remote sensing technologies for observation and forecasting in selected parts of Asia to provide governments and other organizations with timely information on rice crop area and production for planning and responding to natural catastrophes. RIICE, funded by the Swiss Agency for Development and Cooperation, is a collaborative initiative of IRRI, sarmap, Allianz, and GIZ. “This forum is a venue for sharing scientific data, policies, and models for climate change adaptation, disaster resilience, and food and nutrition security, as well as understanding capacities and links between local and national early warning systems,” explained Praveen Agrawal, representative and country director of UN WFP-Philippines. The forum was held on 26 November in Makati City. It was attended by representatives from Philippine national and regional line agencies, academic and scientific/research institutions that can provide technical knowledge on forecasting and early warning systems, and provincial governments involved in the development and implementation of early warning standard operating procedures. Tanzania and IRRI have committed to doing more collaborative work. Marco Martin Mwendo, plant breeder and seed scientist from Tanzania's Agricultural Seed Agency, and Charles Chuwa, plant pathologist from Dakawa Agricultural Research Institute, learned more about IRRI’s research work and facilities during their four-day visit. The officials from the East African country visited the institute on 21-26 November. Abdelbagi Ismail, overall project leader of the STRASA (Stress-Tolerant Rice for Africa and South Asia) project and IRRI principal scientist gave a tour of the different scientific facilities and field experiments featuring research on abiotic stresses. Possible areas of collaboration were discussed during the visitors’ meetings with Bruce Tolentino, deputy director general for communication and partnerships, Corinta Guerta, director for external relations, and several IRRI senior scientists and management staff. IRRI will work with Tanzania on building the knowledge and skills of Tanzanian rice breeders and scientists, including learning to use geographical information systems and identifying suitable stress-tolerant rice varieties for farmer selection and adoption. The Tanzanian officials also met Noel Magor and the Training Center team; Tobias Kretzschmar of the Genotyping Laboratory Services; Prabhjit Chadha-Mohanty of the Genetic Transformation Laboratory; Mallikarjuna Swamy and Rafiqul Islam on rice biofortification—high-zinc rice and stress-tolerant rice, respectively; Nese Sreenivasulu on grain quality and nutrition; and James Quilty on ecological intensification and seed processing. Marco and Charles also visited the neighboring University of the Philippines Los Baños, and the SL Agritech farm in Sta. Cruz, Laguna, to learn how a private company conducts seed production. Los Baños, Philippines - Philippine Vice President Jejomar Binay visited IRRI headquarters earlier today for a briefing on rice science and food security. The vice president and his party were welcomed by IRRI Director General Robert Zeigler and the institute's senior leaders. Deputy Director General Bruce Tolentino presented an overview of IRRI's research agenda and its partnership with the Philippine government through the Food Staples Sufficiency Program (FSSP). FSSP objectives include bolstering national resilience to impacts of climate change, increasing adoption of yield-enhancing technologies, and conserving traditional rice varieties. In response, the vice president emphatically stated that he would like to "focus on modernizing agriculture, ensuring all farmers gain access to the best technology, especially those developed at IRRI since the institute is located in the Philippines." The vice president also visited the Long-Term Continuous Cropping Experiment, and the International Rice Genebank, which holds in trust for the world 127,000 different rice varieties. Odisha, India - IRRI Director General Robert Zeigler officially opened the Analytical Laboratory at Orissa University of Agriculture and Technology (OUAT) on 21 November 2015. The IRRI-OUAT laboratory will be used for soil and plant analyses by postgraduate agriculture students and university and IRRI scientists. OUAT Vice Chancellor Manoranjan Kar, College of Agriculture Dean L.M. Garnaik, Professor C.M. Khanda, faculty, and students attended the event. Also at the inauguration were IRRI scientists, including J.K. Ladha, U.S. Singh, Samarendu Mohanty, Sudhanshu Singh, and Manzoor Dar. Hyderabad, India - IRRI Director General Robert Zeigler received an award for his contributions to rice research and development globally, and especially in India. Hon. Bandaru Dattatreya, Union Minister for Labor and Employment, presented the award to Zeigler at the International Rice Symposium. Zeigler was one of the guests of honor along with Dr. David Bergvinson, the director general of the International Crops Research Institute for the Semi-Arid Tropics; R Rajagopal, additional secretary India's e Department of Agriculture and secretary of the Indian Council for Agricultural Research; and A. Padma Raju, vice-chancellor of Acharya NG Ranga Agricultural University (ANGRAU). This year's International Rice Symposium had as its theme Rice Science for Global Food and Nutritional Security and was attended by about 700 rice scientists, policymakers, industry representatives, and farmers from around the world. Genetic gain, genomics, resource management, soil and crop health, biotic stress management, policy, technology transfer, postharvest technologies, and value addition were some of the topics discussed during the symposium. The event was held on 18-20 November in Hyderabad. It was organized by the Indian Institute of Rice Research, the Central Rice Research Institute in Cuttack, Professor Jayshakar Telangana Agricultural University, IRRI, ANGRAU, and the Society for Advancement of Rice Research in Hyderabad. Odisha, India - IRRI Director General Robert Zeigler was awarded an honorary Doctor of Science degree (honoris causa) by the Orissa University of Agriculture and Technology (OUAT) for his outstanding contributions to global agriculture. Zeigler was also honored for his contributions to rice research in India. During his tenure as IRRI director general, Zeigler also strengthened the partnership between OUAT, the Department of Agriculture, and other organizations in Odisha for improving the quality of rice research and development to improve the lives of farming communities in the face of a changing climate. Zeigler received the degree from Vice Chancellor Manoranjan Kar on 21 November 2015. "I think nothing can get more original or local as Philippine heirloom rice. It's something that we should be proud of, and it deserves a place in international kitchens," said Ken Dacanay, a sous chef of Cyma and Green Pastures restaurants after quickly demonstrating one of their two popular heirloom rice recipes at the 9th Knowledge Learning Market and Policy Engagement (KLM-PE) event last 25-26 November. KLM-PE was organized by the International Fund for Agricultural Development (IFAD) Philippine Office, in coordination with the Departments of Agriculture (DA) and Agrarian Reform (DAR), with support from various civil society organizations that recognize the value of smallholder farmers and family farming in the country. Seen as a viable model for sustainable agricultural development, family farming found favor with many participants of the KLM-PE that not only included groups of smallholder farmers, but also fisherfolk and producers of poultry, livestock, dairy, and other agricultural products. IRRI is currently supporting many smallholder farmers in the Cordillera region of the Philippines through its Heirloom Rice Project (HRP) with the DA and an IFAD grant called the Cordillera Highlands Agricultural Resources Management Project. The project had previously been under the technical innovation services component of the Consortium for Unfavorable Rice Environments (CURE). “We’ve adopted the so-called value chain approach with the HRP,” explained Dr. Digna Manzanilla, CURE coordinator and IRRI social science expert. “That is,” she continued, “we’re helping farmers with the production system -- from improving the product, to processing, then analyzing preferences of the consumers, to promoting the heirloom rice varieties themselves. “And one of the ways by which we do this is through partnerships with some well-known chefs in the country,” she explained. A total of 11 farmers’ organizations are currently involved with the HRP, most of which have been exporting their heirloom rice varieties, she added. "For this year, the [cooking] demonstrations are something different at the KLM-PE because we had always focused on discussions about policy, good practices, and others. But, I'm so happy with the case of heirloom rice because it's been able to link a product to markets such as restaurants," remarked Yolando Arban of the IFAD country program office in the Philippines. "So there is value adding in terms of developing these products. I was just joking a few minutes ago that I'd only be able to cook a simple arroz caldo [rice porridge] but with this, rice gets a special twist. So this is very important and very good," he added. "Our heirloom rice is really quite versatile. So we thought, 'Why not use them for dishes that are even popular outside of the country?'" asked fellow sous Chef Marvin Paul Catalan of Cyma and Green Pastures restaurants. He explained that, arroz con pollo, for instance, uses arborio rice from Spain, the same kind used in making risotto. But they found out that tinawon, a type of heirloom rice, also shared similar characteristics with arborio so they decided to try it for their dish. The result was quite good. "Plus, we were able to support local farmers and help our local market because we're using what's available locally and don't need to import from other countries," he explained. Apart from heirloom rice, about 92 farmer-participants of the KLM-PE were also able to get climate-smart rice seeds for free through IRRI's Next Generation project with the DA. KLM-PE was held at the Convention Hall of the Bureau of Soils and Water Management in Quezon City, Philippines. Shykh Seraj is a Bangladeshi journalist, media personality, and agricultural development activist who has been promoting agricultural development in Bangladesh through electronic and print media for over 30 years. Seraj is credited with revolutionizing the agricultural sector of Bangladesh through television. He is also the founder of the first-ever Bengali satellite television station in Bangladesh. Seraj has received numerous accolades for his work, including the prestigious A.H. Boerma award from the UN Food and Agriculture Organization for his outstanding development journalism in the field of agriculture. Seraj and other journalists from his network visited IRRI on 26 November to discuss possible collaborative media activities with the institute's communication unit. 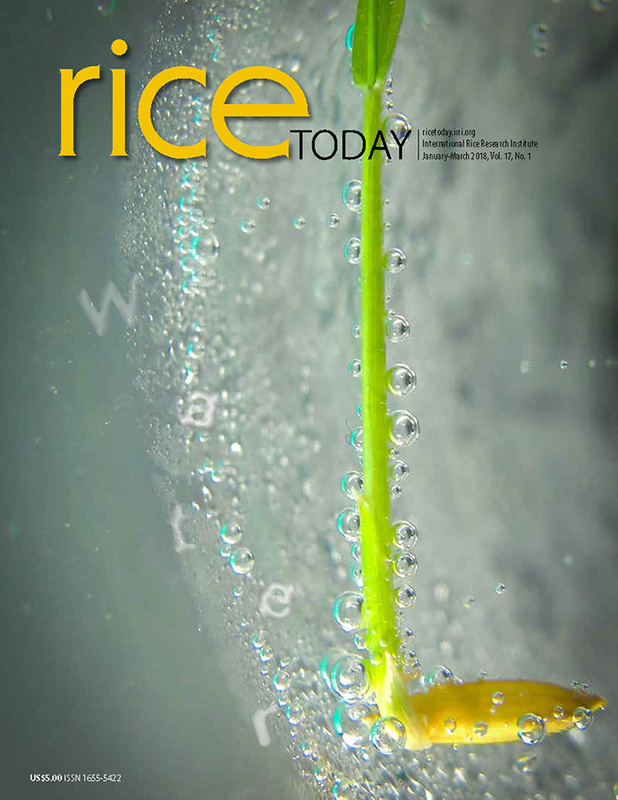 Seraj acknowledged what IRRI has done for the farmers of Bangladesh and offered to contribute to Rice Today magazine. Seraj also shared his strategy for popularizing developmental journalism in Bangladesh, including the use of social media. “Farmers are human beings so we make various programs for them that cover entertainment, health, culture, festivals, and others,” he said. During their visit, Seraj and his fellow journalists interviewed IRRI Director General Robert Zeigler, and Noel Magor, head of the Training Center, and Ruaraidh Sackville Hamilton, head of the T.T. Chang Genetics Resources Center and the International Rice Genebank. The IRRI Training Center, in collaboration with Project IPaD, conducted the Basic Scientific Writing Course (BSWC) on 16-20 November and the Basics of Rice Production Course (BRPC) on 25-27 November 2015 at the IRRI headquarters. The BSWC is a five-day course intended to help scientists and researchers develop their skills in written communication, making them more effective in sharing knowledge and research results in the future. 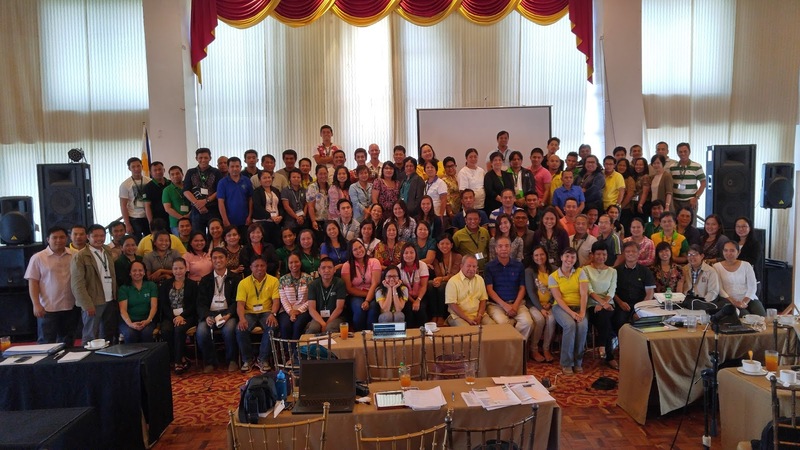 The course was attended by 17 scientists and researchers from IRRI, the Department of Agriculture, and the University of the Philippines Los Baños. The BSWC was facilitated by Ms. Teresita Rola and Ms. Majilene Marikit and coordinated by Ms. Maria Socorro Arboleda. On the other hand, the BRPC is a three-day orientation on the whole process of rice production, from seed processing to postharvest management. The course is designed to update participants’ knowledge and skills on best practices and technologies associated in rice farming. This course gives participants a chance to get their feet wet in the mud, providing hands-on experience of actual field preparations. The course was attended by 25 young researchers from different Department of Agriculture offices throughout the Philippines. They were all supported by Project IPaD. The course was coordinated and facilitated by Engr. Eugene Castro, Jr., (see photo below) with Ms. Majilene Marikit as co-facilitator. Project IPaD (Improving Technology Promotion and Delivery Project) is jointly led by PhilRice, the DA-Agricultural Training Institute, and IRRI. It aims to improve rice technology promotion and delivery by enhancing the capability of the next generation of extension professionals and other knowledge intermediaries. Project IPaD supported 12 participants for the BSWC and 25 participants for the BRPC. Rice production, writing, and communication skills courses are scheduled to be offered again in 2016 at the IRRI Training Center. For training dates and other information, please visit http://www.training.irri.org/short-courses/2016-list-of-short-courses. Participants of the 7th National Biotechnology Education Center for Teachers (NBECT) coming from Metro Manila and nearby provinces visited IRRI as part of the National Biotechnology Week celebrations. Golden Rice network coordinator Violeta Villegas welcomed the group. About 70 high school teachers attended the three symposia presented by BIOTECH-UPLB’s program leader Mannix Pedro, National Institute of Molecular Biology and Biotechnology (NIMBB)’s Assistant Professor Ma. Anita Bautista, and Museum of Natural History Director Juan Carlos Gonzales. Coinciding with this event, the National Biotechnology Quiz Contest was held at BIOTECH-UPLB with about 50 high school students participating. The Philippines, through Presidential Proclamation No. 1414, celebrates the National Biotechnology Week (NBW) every year during the last week of November, in support of promoting the safe and responsible use of biotechnology and its products. This year’s celebration is led by DOST with the theme Bioteknolohiya: Kaagapay ng Mamamayan sa Pambansang Kaunlaran. Around 500 farmers, mostly women, attended the Field day on flood-tolerant Swarna-Sub1, seed production, mechanical transplanting, and direct-seeded rice in Resinga Village, Puri District in Odisha on 20 November. During the field day, IRRI scientists from the Cereal System Initiatives for South Asia (CSISA) project and the Stress-Tolerant Rice for Africa and South Asia (STRASA) project, experts from India’s Department of Agriculture, and the Association of Seed Certification Office in the country shared various technologies and knowledge with the farmers. The field day also featured a question and answer (Q and A) session between IRRI Director General Robert Zeigler and the farmers. The topics discussed during the Q and A included adoption of flood-tolerant Swarna-Sub1, improved farm practices, climate change, grain quality, and facilities for farmers to get the minimum support price. Some solutions to problems such as crop insurance, credit facilities, laser land levelling, use of hybrid rice, use of chemical fertilizers, herbicides, and pesticides, most preferable crop after rice were also examined. In the near future, IRRI would come up with a rice variety that can tolerate both flood and drought to solve problems brought by unpredictability of weather patterns because of climate change, Zeigler added. The Institute will also be part of “bringing the Green Revolution in eastern India,” which is both a goal and a policy in the country, in the same way IRRI contributed to the Green Revolution in India. The field day was organized by CSISA team of the IRRI hub Odisha in collaboration with India’s Department of Agriculture. IRRI Director General Robert Zeigler was inducted into the National Academy of Agricultural Sciences (NAAS) in India. He received the award from Dr. S. Ayyappan, the president of the Academy, who is also an IRRI Board of Trustees member, on 23 November 2015 in New Delhi. Dr. Zeigler earlier received the Fellowship in recognition of his outstanding global research leadership in the application of advanced techniques of molecular biology and biotechnology in crop improvement and for harnessing its benefits for smallholder farmers across the world. He started his service as NAAS fellow on 1 January 2015. 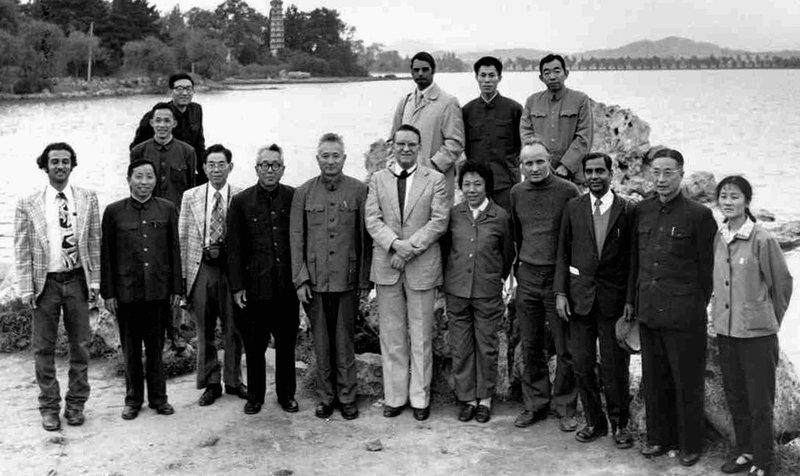 NAAS was established in India by agricultural scientists both within the country and abroad 25 years ago. The fellows of the academy are recognized for their contributions to science and are distinguished personalities in the field of agriculture and allied sciences that include World Food Laureates, Fellows of Royal Society, Third World Academy of Sciences, among others. The academy aims to provide a forum for agricultural scientists to deliberate on important issues in agricultural research, education, and extension; and to present views of the scientific community as policy inputs to planners and decision-makers at both national and international levels. LOS BAÑOS, Philippines – On November 20, in the middle of APEC 2015, Mr. Shigetoshi Aoyama, director of the Asia-Pacific Economic Cooperation (APEC), took time to visit the International Rice Research Institute (IRRI) headquarters two hours south of Manila to learn about a proposal that seeks to speed up mechanization of rice farming in Asia. Migration of rural laborers from farm to urban centers has created labor scarcity that is affecting agricultural production in many Asian countries, including Japan. Millions of smallholder farmers across Asia do not have the means to pay the high wages of workers to carry out labor-intensive farming activities. In India alone, labor shortage affects the farm operations of about 600 million smallholders. Labor scarcity is an increasingly widespread problem that IRRI is trying to solve through mechanization, said Bruce Tolentino, deputy director general for communication and partnerships at IRRI. Engr. Martin Gummert, senior scientist at IRRI’s Postharvest Unit, presented to Mr. Aoyama a proposal for a mechanization hub in which IRRI will be the center of a network that will facilitate transfer of mechanization technology and build capacity on the use of such technologies in target countries. The network will bring together countries such as Japan, China, and the US; the private sector; donor and funding agencies; and major rice-producing countries. The Department of Agriculture’s National Rice Program (DA-NRP) project on Accelerating the Development and Adoption of Next-Generation Rice Varieties for the Major Ecosystems in the Philippines (Next-Gen Project) held its year-end assessment and planning workshop on 16-20 November 2015 in Dauis, Bohol. Participants included representatives from DA-NRP, IRRI, PhilRice, Bureau of Plant Industry (BPI), University of the Philippines Los Baños (UPLB), and the DA Regional Field Offices (DA-RFOs). The collaborative project, led by Dr. Georgina Vergara (IRRI) and Ms. Thelma Padolina (PhilRice), is an initiative under the Food Staples Sufficiency Program (FSSP) of the Department of Agriculture (DA), PhilRice, and IRRI, in partnership with UPLB, the DA-RFOs, state colleges and universities, local government units (LGUs), and rice farmers. The project aims to mitigate the impact of climate change and achieve food security by fast-tracking the introduction and adoption of higher-yielding inbred and hybrid rice varieties resistant to major pests and diseases and tolerant of adverse environments. During the 3-day workshop, DA-RFO representatives presented their accomplishments in 2015, as well as their physical targets and budget for the 2016 and 2017 activities. Issues and recommended strategies to address those were also discussed. The participants also visited PVS (participatory varietal selection) and NCT (national cooperative testing) sites in Ubay, Bohol. The lively interaction among participants resulted in a successful workshop where they shared ideas and strategies helpful in the improvement and conduct of different Next-Gen activities, which ultimately impact farmers’ productivity as they adapt to the effects of climate change. Overall, the workshop strengthened collaboration between the partner institutions, which would help facilitate the development of improved varieties and increase rice productivity, helping farmers adapt to the effects of climate change. As part of continuing efforts to strengthen partnership with its host community and government, IRRI donated a total of nine utility vehicles to the Municipality of Bay, Laguna and the Land Transportation Office (LTO) of the Cavite-Laguna-Batangas-Rizal-Quezon (CALABARZON) region. In a ceremonial turnover on 19 November 2015, Mr. Bruno Ramos, mayor of the Municipality of Bay, accepted seven vehicles, including two pickup trucks, from IRRI. The mayor expressed his appreciation to the institute, and announced the stewards and recipients of the donation: (1) Bay District Hospital (formerly known as PPL, Pagamutang Pangmasa ng Laguna); (2) Bay Municipal Police; and five out of 15 barangay or community village recipients—(3) Barangay Masaya, (4) Barangay Tranca, (5) Barangay Paciano Rizal, (6) Barangay Tagumpay, and (7) Barangay Santo Domingo. During the vehicle turnover ceremony held in Bay, IRRI Deputy Director General for Communication and Partnerships, Bruce Tolentino, mentioned that IRRI is supported by several governments, including the government of the Philippines. He emphasized that the municipality of Bay is home to many IRRI staff members. “Many employees at IRRI are residents of this town. 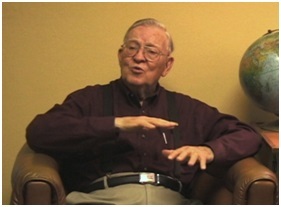 To IRRI, Bay is not only a neighbor, but also a friend,” he adds. Mr. Anselmo Pastidio, barangay captain of Santo Domingo, said that the donated vehicle will be helpful to citizens in the community, especially during disasters. Santo Domingo is one of the economically fast-growing barangays in Bay, with an area covered by subdivisions, commercial buildings, and rice paddies. The barangay has around 8,000 inhabitants who are often affected by floods caused by overspill of waters from the nearby Laguna de Bay. “A ready means of transportation (service) is basic when typhoons strike. So we are grateful to IRRI for this pickup truck. It will serve our people well,” said the barangay captain. In another turnover ceremony to LTO CALABARZON held on 23 November 2015 at IRRI headquarters, LTO Regional Director Eric Lenard Tabaldo (top photo) thanked IRRI and said that the two vehicles they accepted will address a need for patrol vehicles in some locations where there are none. 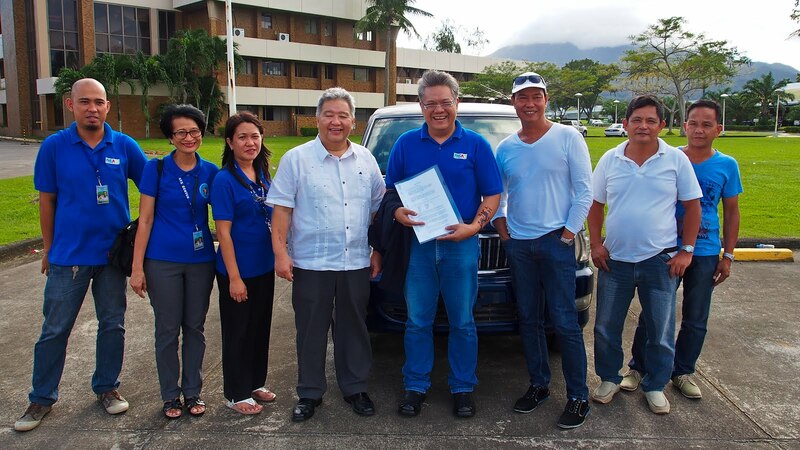 He added that his team looks forward to continuing the partnership with IRRI’s transport services in conducting a series of seminars for drivers. The most recent drivers’ seminar was held at IRRI in July 2015. The Young Researchers' Lunch for November hosted Star Yanxin Gao, a Breeding Informatics Instructor at Cornell University, USA. Dr. Gao visited IRRI as part of the Genomic Open Source Breeding Informatics Initiative (GOBII) project funded by the Bill & Melinda Gates Foundation. GOBII is a collaboration of software engineers, geneticists, and plant breeders at CGIAR centers in Mexico, India, and the Philippines. Together they will develop databases and software tools for breeders to use genomic information for identifying diverse farmers’ needs, developing analytical tools to help breeders make selections among breeding lines, and integrating the new tools into existing information systems used by each CGIAR center. Dr. Gao (third from the right in photo) also emphasized the importance of taking care of both work and personal relationships. She said that even though it's important to work hard at our careers, we should always prioritize our relationships with other people both at work and in our personal lives because that is what can keep us happy over the long term. The Philippine Rice Information System (PRISM) project held its first National Convention from 9-12 November 2015 at the Hotel Rembrandt in Quezon City. The national convention, which was jointly organized by the Philippine Rice Research Institute, the Department of Agriculture National Rice Program, and the International Rice Research Institute, was attended by partners from all the participating regions in the country, as well as partners from the Bureau of Plant Industry and the Philippine Statistics Authority. The week-long event had three components: (1) presentation of the overall outputs and accomplishments of the project, (2) assessment of project implementation, (3) and a planning workshop for the activities and financial requirements in the following years. The outputs, which include rice area maps, yield estimates, damage assessments, production situation, and incidence of pests and diseases, were presented by Ms. Mary Rose Mabalay (PhilRice) and Mr. Edwin Martin (PhilRice). The assessment part was participatory. The participants were asked to identify issues and propose strategies to address those issues. The planning workshop was a special component of the convention and was organized to finalize the sustainability plan of each region. Jojo Lapitan and Edmund Sana, FSSP project consultants, provided guidance to the participants as they prepared the plan for their region. The International Rice Research Institute (IRRI) Risk Management and Quality Assurance-Research Data Management (RMQA-RDM) training team conducted its Research Data Management (RDM) 101 course on 17-19 November at the Institute’s headquarters. RDM 101 covers various areas of data management including research data planning; data collection, authentication and analysis; data storage, backup, and security; and data archival and sharing. The training team also discussed and demonstrated file management tools and software including Beyond Compare, Cobian Backup, WinDirStat, Mendeley, Labfolder, Google Drive, and the IRRI Dataverse, an online repository for data archiving and sharing. Lea delos Reyes of the Library and Documentation Services and Rogelio Alvarez of the Information Technology Services delivered lectures on open access/open data and data backup, security, and storage, respectively. Elizabeth Alcachupas, Bui Phuoc Tam, Enrykie Fortajada, Jeric Gado, Benedict Jardinero, Dorothy Onyango (CESD), Cindy Llorente (GQNC), Vitaliano Lopena (PBGB), Maureen Muñoz, Ayessa Ocampo (DA-RFO III), Maria Corazon Palileo (DA-RFO VII), and Stoix Nebin Pascua (UPLB-CPAf) attended the two-and-a-half-day training course. The training team is headed by IRRI-RMQA Senior Manager Menchu Bernardo with Enrico Francisco Mercado, senior specialist, Research Data Management. This is the final RDM 101 course for the year. The course is conducted quarterly.